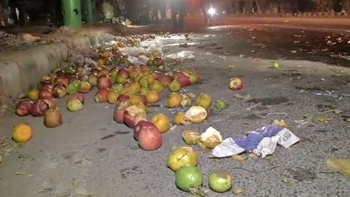 New Delhi, Dec 5: The 28-year-old driver of the Mercedes car which allegedly ran over and killed a fruit vendor and injured another near Dwarka's Ganpati Chowk was arrested on Tuesday, police said. Nukul, a resident of Raj Nagar, Palam Colony was behind the wheel of the luxury car when the accident occurred on Sunday night, police said, adding that the vehicle involved in the accident was seized. According to a senior officer, a Mercedes emblem was found at the spot which prompted the police to procure details of about 4,000 cars of the same marquee from the Road Transport Authority to ascertain the details of the vehicle involved in the accident. Police said an eyewitness and the person who called to inform about the accident too were questioned. As there were no CCTV cameras around the accident spot, the footage from adjacent roads was analysed. The accident claimed the life of 35-year-old Sarvesh and injured 30-year-old Inder as they were returning home after work from the weekly market. Sarvesh was taken to the Deen Dayal Upadhyay Hospital where he was declared brought dead, while Inder, who sustained serious injuries, was admitted to the Ayushman Hospital in Dwarka.